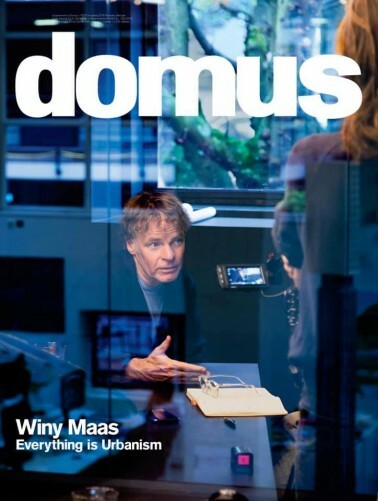 The seminal architectural publication Domus presented its new director: Winy Maas. The MVRDV principal and co-founder will head Domus for the upcoming 10 issues as part of the magazine’s new 10x10x10 editorial strategy. Maas is the second Editor-in-Chief selected as part of this 10-year plan, following in the footsteps of Italian architect and designer Michele De Lucchi. As the newly appointed editor in chief, Winy Maas launches a positive vision, a dare to change and a stimulus to intellectual and collective responsibility: “We need an agenda for change. Our planet is subject to dramatic climate changes that require all of us – politicians, urban planners and citizens – to accelerate our action to save it. But we are still too slow. Domus will act as such an agenda”, Maas announces in his manifesto of intent, published together with the special monograph dedicated to him and included in the magazine’s December issue.